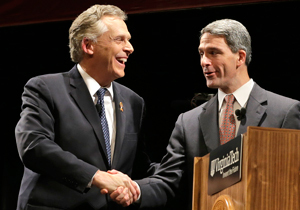 By Warren Fiske on Monday, November 4th, 2013 at 11:14 a.m.
Democrat Terry McAuliffe, left, and Republican Ken Cuccinelli shake hands before their final debate in the Nov. 5 gubernatorial election. Photo by AP. There’s a famous court martial scene in the movie "A Few Good Men" where a Navy lawyer played by Tom Cruise cross examines a hardened Marine colonel played by Jack Nicholson. "I want the truth," Cruise shouts. "You can’t handle the truth,’ Nicholson snears. Envision the same scene with Virginia’s electorate playing Cruise’s role and either Republican Ken Cuccinelli or Democrat Ken Cuccinelli filling in as Nicholson. What would we call this flick? Here’s a suggestion: "The Virginia Gubernatorial Campaign." The two candidates fared miserably on the Truth-O-Meter this fall. Of the 14 Cuccinelli claims PolitiFact Virginia fact checked, 10 were rated Mostly False or worse. McAuliffe was even worse -- 11 of his 13 rated statements were Mostly False or worse. Let’s plot the results on a composite grading scale, where a politician is given five points for every True rating, four for Mostly True, three for Half True, two for Mostly False, one for False and zero for Pants of Fire. Cuccinelli’s average score during the last months was 1.86, slightly below Mostly False. McAuliffe’s average was 1.62. If you think those are standard grades for politicians in a heated election, consider this: During last year’s tough race in for Virginia for a U.S. Senate seat, Democrat Tim Kaine’s average was 3.58; Republican George Allen’s was 3.26. Why the drop this time around? Well, Allen and Kaine had plenty of policy differences last year, but their campaigns didn’t get personal or bogged down in social issues. They contrasted their records as former governors and focused on economic issues facing the federal government. Often, they offered reams of data to support their claims. This year’s campaign, in contrast, has been decidedly personal, negative and focused on delivering knock-out blows. Cuccinelli has portrayed McAuliffe as a fast-talking profiteer in for the short haul. McAuliffe has painted Cuccinelli as a right-wing extremist with an unstated agenda of outlawing abortions and restricting contraception. Each candidate has overshot in trying to give voters a reason not to support his opponent. Ethics has been a huge issue and the subject of a half-dozen of our fact checks. The race, at times has been overshadowed by a scandal involving more than $150,000 in gifts and loans that Gov. Bob McDonnell and his family accepted from Jonnie Williams, chief executive of Star Scientific, a financially-troubled dietary company that sought state business. The controversy reached down to Cuccinelli, who received about $18,000 in gifts from Williams, many of which he initially neglected list on state disclosure forms. McAuliffe hammered Cuccinelli on the gifts. But that backfired during a July debate when he repeatedly said a special prosecutor concluded Cuccinelli "should have been prosecuted" but Virginia’s disclosure laws were too weak. The prosecutor, in fact, said nothing of the kind and completely cleared Cuccinelli of wrongdoing. McAuliffe earned a Pants on Fire. Cuccinelli responded with some harsh and inaccurate attacks on McAuliffe’s ethics. He ran an ad accusing McAuliffe of making millions from the demise of Global Crossings, a fiberoptics firm that crashed in 2002 and laid off more than 10,000 workers. In fact, McAuliffe made an $8 million profit by selling his Global Crossing shares in 1998 when the stock was near an all-time high. We rated Cuccinelli’s claim False. In another ad, Cuccinelli said McAuliffe is under investigation by the Security and Exchange Commission. In fact, the SEC is looking into activities by GreenTech Automotive, an electric car company McAuliffe founded in 2009. He quietly resigned as GreenTech’s chairman last year, although he remains a major shareholder. McAuliffe said he had not been contacted by the SEC. There’s no indication McAuliffe is being investigated and Cuccinelli couldn’t provide any. So he got another False. McAuliffe, throughout his business career, has been considered a consummate salesman. But sometimes, it seems, he can’t resist overstating his pitch to voters. In a June speech, for example, he declared that the statewide GOP ticket led by Cuccinelli "says its top priority is to outlaw all abortion." The problem is that neither Cuccinelli nor his two running mates -- all staunchly anti-abortion -- ever said that. They said their No. 1 goal is to create jobs. Chalk up a False for McAuliffe. We should acknowledge here that candidates got a few things right. Cuccinelli received the only True rating of the campaign for his January statement that Virginia is the only state with a tradition of its attorneys general resigning when they run for governor. Cuccinelli said this right after making it clear that he would be staying on as attorney general. We researched back to 1985 and found 31 states had attorneys general who ran for governor and not a single one stepped down. PolitiFact Virginia’s highest seal of approval, however, did not serve Cuccinelli well. He was under constant criticism for events that took place in the attorney general’s office this year. McAuliffe’s top mark was a Mostly True for his claim in May that the state has cut community college funding by $1,908 per student since 2008. The correct figure is $1,700. The further away we move from this election year, the better McAuliffe and Cuccinelli performed on the Truth-O-Meter. Back in 2011, each of the candidates had two claims that were rated True. Conversely, the closer we got to Election Day, the worse the candidates performed. During last month’s partial shutdown of the federal government, McAuliffe earned a Pants on Fire for claiming Cuccinelli tried to bring Virginia’s government to a standstill. As proof, McAuliffe cited a budget amendment Cuccinelli offered in 2008 to defund Planned Parenthood that locked the Senate in a four debate. Not to be outdone, Cuccinelli claimed that McAuliffe threatened to shut down the state government by promising he would not sign a budget that did not expand Medicaid. We rated that one False because the budget automatically becomes law if the governor refuses to sign it. Each candidate voiced frustration at the lack of specificity in the other’s policy proposals. So McAuliffe decided to fill in some details for Cuccinelli and vice versa. The results did not help their composite Truth-O-Meter scores. Cuccinelli wants to reduce corporate and income taxes by $1.4 billion, but promises he won’t pursue his goal if he can’t convince the legislature to pay for the cuts, largely by closing inefficient tax breaks. The problem is that Cuccinelli won’t identify any loopholes he wants to close, saying he would appoint a commission to make recommendations. McAuliffe, ignoring the conditions Cuccinelli set for pursuing his plan, sounded warnings that the tax cut could force the firing of "over 8,000 teachers." Another False, not that it stopped the Democrat from repeating the claim, only with 6,500 teachers getting fired. On the other hand, McAuliffe has endorsed some broad policy goals, such as ending education debt for college graduates, raising Virginia teacher salaries to the national average, and restoring cuts deep state cuts to the public schools budget that were made during the Great Recession. Cuccinelli interpreted those aspirations as promises by McAuliffe and made a series of worst-case assumptions about his opponent would implement the programs. And during the closing days of the campaign, he’s been running a TV ad saying warning voters that McAuliffe "wants to raise your taxes $1,700 to pay for his infinite promises." Guess what? We rated that one False, too.